Staring at the eye of the presiding judge in the courtroom at Rangoon's notorious Insein Prison on September 09, 2008, a towering figure of Burma's pro-democracy movement, Min Ko Naing addressed in a thunder voice,“You can sentence us to a thousand years in prison for our political activities, but we will continue to defend ourselves in accordance with the law. Nobody can hide from justice.” Min Ko Naing made this defiant statement when he and 34 other detained former student leaders of the 88 Generation Students' group appeared in the Rangoon East District Court, located in Insein Prison. Their lawyer, Nyi Nyi Hlaing said that they were facing a variety of charges related to their involvement in last year’s protests. In fact, this protest of the former leaders of the 88 Generation Students' group in last year’s August has ultimately turned into the largest anti-regime demonstrations in twenty years since 1988 and became known as the Saffron Revolution drawing tens of thousands of monks and the common people to the streets of Rangoon and all other major cities of the country demanding the end of the despotic military rule which has turned the country into a pauper state and forced millions of the people to live a miserable life with half-naked body full of hunger and grief. Min Ko Naing and his colleagues were charged of violations of Electronics Act 33A, the Illegal Organizations Act 17/1 and Section 4 of SPDC Law No 5/96, which prohibits actions that “endanger the national convention”.. Mentionably, it is the guidelines of the stage-managed farcical National Convention where only the military hand-picked delegates have attended and which has paved the way for the 54-member Constitution Drafting Commission to draft a pro-military constitution on which the military regime staged a referendum drama in the country on last May 2008 and is going to be followed by the general elections in 2010. This sham constitution contains all the provisions to glorify the militarism in the governance where the head of the army will be the most powerful person in the country, with the ability to appoint key cabinet figures and suspend the constitution in the event of an emergency that he defines. It also stipulates that no amendments to the charter can be made without the consent of more than 75 percent of lawmakers, making changes impossible without the support of the military representatives in Parliament who occupy 110 seats out of the 440-seat lower house which is called Pyithu Hluttaw (House of Representatives), and 56 seats out of the 224-seat upper house which is called Amyotha Hluttaw (House of Nationalities). Moreover, in the event of a "state of emergency" which the tatmadaw (armed forces) is given the authority to declare at any time, the commander in chief would assume full legislative, executive and judicial powers. They were also charged with violating Article 130B of the Penal Code, which prohibits libel against friendly foreign powers, which stemmed from their alleged criticism of China and Russia for their role in vetoing a draft UN Security Council resolution on Burma in January 2007. They were also accused of speaking with the exiled media and the recorded interviews and other items uploaded to Web sites operated by Burmese exiles were produced as evidence. On August 27, 2008, the authority was formally requested to permit Min Ko Naing and his colleagues to appear in the court without handcuffs, but they were brought to the courtroom in handcuffs. Many of these veterans of Burma’s pro-democracy movement have spent more than a decade in prison for their political activities. Besides Min Ko Naing and Ko Ko Gyi, other prominent members of the 88 Generation Students’ Group who are now in detention, include Htay Win Aung, Min Zeya, Mya Aye and Kyaw Min Yu - also known as Ko Jimmy. The original name of Min Ko Naing is Paw U Tun . He was born on 18 October 1962 in Rangoon. He is the third son of U Thet Nyunt and Daw Hla Kyi. His parent are mon-chinese race from Mudon in Mon State . He has three sisters. They are Daw Kyi Kyi Nyunt, Daw Ye Ye Nyunt, Daw Thadar Nyunt. His family lives in No(151/Ka), Waizayantar Road , (16/2) Ward, Thingangyun Township , Rangon. Min Ko Naing literally means "conqueror of kings" which was adopted as a pseudonym by Paw U Tun and by at least 18 other students in 1988 to sign posters and leaflets criticizing the military rule. While a student at the University of Rangoon in the 1980s, Min Ko Naing secretly organized a nationwide student union to oppose decades of military rule. In March 1988, demonstrations began in Rangoon, the then capital of Burma to protest the government mismanagement of the country’s economy which turned the resource-rich Burma into the world’s poorest country and was accorded Least Developed Nation status by the UN that year in the wake of the demonetization of much of the Burmese currency in 1987 by the military government of General Ne Win. This has eventually led to an unprecedented civil unrest. And Min Ko Naing soon emerged as a leader, encouraging people to use peaceful means to express their frustration. At the height of the mass civil disobedience campaign against 26 years of one-party military rule in Burma, the All Burma Federation of Student Unions (ABFSU) was formed on 28 August 1988 and Min Ko Naing was made the chairman of the ABFSU. At the founding rally of the ABFSU, Min Ko Naing called on students throughout the country to struggle peacefully against military rule and for democracy and freedom of association. After violently suppressing the pro-democracy demonstrations and gunning down about 10,000 people in August 1988, the military seized power again in September 1988 and formed a new government, called the State Law and Order Restoration Council (SLORC). Martial law decrees were issued, including a ban on any criticism of the military and of any public gathering of more than five people. They arrested hundreds of students for their political opposition activities. Although thousands of young activists fled to neighboring countries, others continued their struggle inside the country. In March 1989, the SLORC began to issue warnings against possible memorial gatherings by students and others to mark the first anniversaries of the deaths of student demonstrators during the initial waves of civil unrest in March 1988. On 24 March 1989, Min Ko Naing was arrested and was sentenced to 20 years' imprisonment under Section 5(j) of the 1950 Emergency Provisions Act, vaguely-worded legislation which is frequently used to imprison political prisoners. Later, his 20 years’ imprisonment was commuted to 10 years under a general amnesty. During the early stages of his detention, Min Ko Naing was severely tortured and ill-treated and his health suffered as a consequence. During his interrogation he was reportedly forced to stand in water for two weeks until he collapsed, and as a result, his left foot became totally numb. For most of his imprisonment Min Ko Naing has been held in complete solitary confinement. In November 1994 the United Nations Special Rapporteur on Burma was also allowed to visit him briefly in prison, and described him as being nervous and thin. Subsequent reports on his health stated that, although it improved, he suffers from a nervous tremor and may have suffered emotionally as a result of his ill-treatment and prolonged solitary confinement. He is believed to suffer from a gastric ulcer. 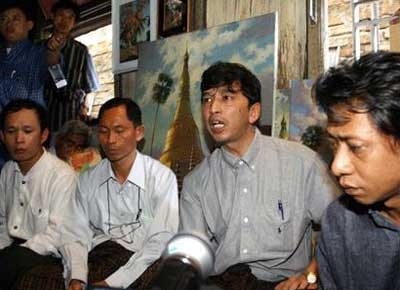 On April 22,2008, a statement of the US State Department said, military-ruled Burma's imprisoned pro-democracy activist Min Ko Naing may go blind after failing to receive medical treatment. Mentionably, political prisoners in Burma routinely face torture during the initial phases of detention when they are often interrogated for hours or even days at a time by rotating teams of Military Intelligence (MI) personnel. During the interrogation, the members of the security forces continue to use torture as a means of extracting information; to punish political prisoners and members of ethnic minorities; and as a means of instilling fear in anyone critical of the military government. Even after sentencing, the political prisoners are vulnerable to torture and ill-treatment, when they can be punished for breaking arbitrary prison rules such as possessing writing paper. In addition, conditions in most prisons are harsh, due to the lack of adequate food, water, sanitation and medical care. After 15 years in prison, Min Ko Naing was released on 19 November 2004, but was rearrested in late September 2006 after almost two years of his release along with other leading student leaders like Ko Ko Gyi, who was freed from prison in 2005, Htay Kywe, Min Zeya and Pyone Cho. On January 11, 2007, he was released again. And for the last time, he was arrested again at midnight on 21 August 2007, with other 13 leaders of the 88 Generation Students for organizing the Saffron Revolution. Min Ko Naing is one of the few top opposition leaders after democracy icon Daw Aung San Suu Kyi. The military regime repeatedly tried to break his spirit. In 1994, the then-U.S. Congressman Bill Richardson visited Min Ko Naing in prison and informed him the regime would permit him to be deported to the United States in exchange for his release, but he refused. For his extraordinary efforts and courage, he won many international awards such as the Civil Courage Prize 2005, the Homo Homini Award by People in Need Foundation, the Student Peace Prize in 2001 and the John Humphrey Freedom Award in Canada on 10 December 1999 and on this occasion, Daw Aung San Suu Kyi made comments about him in a videotaped message which was smuggled out of Burma, “[Min Ko Naing] is one of the student leaders who started the 1988 movement for democracy, and he has stood firm against all pressure from the authorities...[he] represents many others who are suffering from the injustices of the present military regime. That the prize has been awarded to him gives us all great hope, great pride, and great pleasure, because it shows that the world has not forgotten our cause....''.